More comments this morning on valuation issues, something we spoke of last week. Again, just as in 1999 - when a central banker goes bonkers in flooding the system with liquidity, historic valuation tends to be thrown out the window as so many more dollars chased a relatively fixed amount of stock. 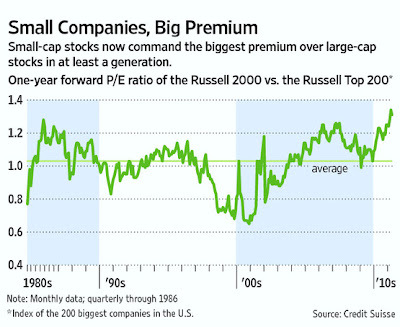 That said, small caps (as represented by the Russell 2000) are now at record forward P/E ratios, and at their largest premium over large caps in a generation. For those newer to the market, small(er) caps have been the horse to ride since the bubble burst in 2000; each year a bevy of fund manager show up on CNBC saying "this is the year of the large cap" - and wrong yet again. The market's smallest stocks are commanding the largest premiums—and some of their biggest fans are becoming alarmed. The Russell 2000 Index, which comprises about 2,000 stocks with small market capitalizations, is within about 2% of a record closing high. It is a milestone that it looks destined to reach well before larger peers such as the Dow Jones Industrial Average and the Standard & Poor's 500-stock index, which are off their record highs by 13% and 16%, respectively. Small companies now command the widest premium over large-cap stocks in at least a generation, based on the ratio of price to earnings. Small caps, which typically have a market value of about $2 billion or less, often do better than large-cap stocks in the first stages of a recovery. With valuations so high, some are girding for a period of underperformance by the Russell 2000. The Russell 2000 is trading at almost 18 times one-year forward forecast earnings, a record high, according to Bank of America Merrill Lynch. That P/E ratio is about 1.3 times the P/E of the market's largest 200 companies as measured by Russell Indexes, according to Lori Calvasina, director of small-cap equity strategy at Credit Suisse, the highest since at least 1979, when her data begin. The valuation gap has approached this level only twice before, in 1983 and 2007. After both instances, small-cap stocks vastly underperformed their larger brethren, Ms. Calvasina says. "We're on borrowed time," she says. "We are transitioning into a new phase of leadership in which large will outperform small." The rally from the March 2009 bottom has seen the Russell 2000 rise 143%, topping the Dow's 89% gain and the S&P's 95% rise. Small caps largely outpaced bigger companies in revenue growth in the past few quarters, Mr. DeSanctis says. They also slashed costs by 10.7% during the downturn of 2008 and 2009, according to Mr. Singh, which compares with 3.2% among S&P 500 companies. Smaller companies have also benefited disproportionately from the Federal Reserve's moves to pump liquidity into the financial system. The added cash has helped buoy all risky assets—and small caps are considered among the most risky in the stock market. .......the Russell 2000 is more heavily weighted toward consumer discretionary stocks than the S&P 500 and less exposed to energy stocks. If oil continues to rise, that may mean the Russell 2000 lags behind.